Ranunculus pollen mounted in air, no cover glass. Ranunculus pollen mounted in clear nail polish. 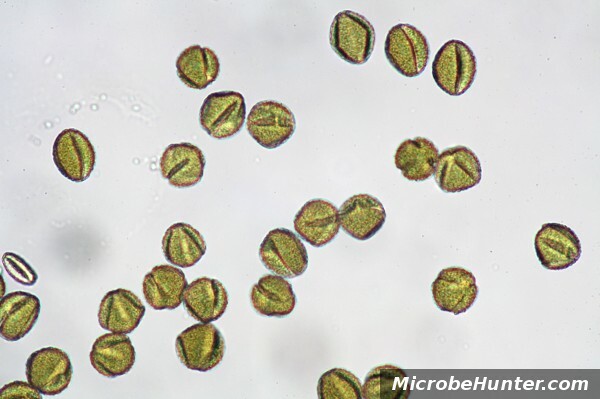 The pollen grains show signs of significant shrinkage. All observations were made using a 20x achromatic objective. Air-mounted specimens show the least details. The pollen grains show a thick dark fringe, which covers much of the details. This is due to the large difference in refractive index between the pollen grains and the surrounding air. Opening the condenser diaphragm reduces the dark fringes, but also lowers contrast and depth of field. The cover glass presses the pollen against the slide, so that more of them are in focus. Otherwise the cover glass did not seem to make much difference. The water-mounted sample provides a much better image. The dark fringes are now gone, due to the similar refractive index of the pollen and the medium. 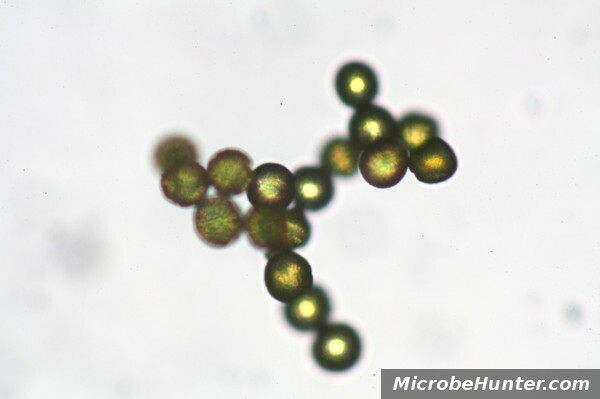 The pollen appear spherical, because the water causes them to swell up. 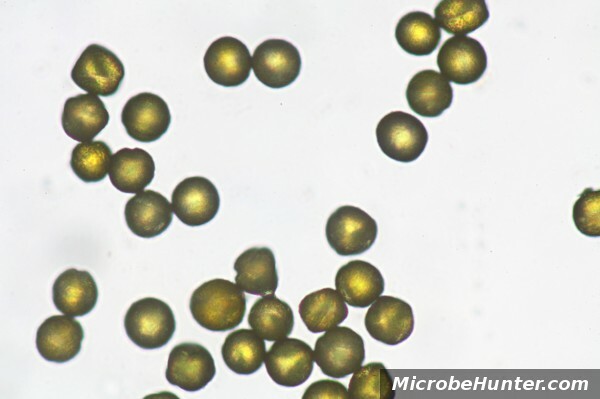 Pollen mounted in Euparal started to shrink and therefore appear smaller in size. Kinks and folds are also visible. These artifacts are produced because the (non-water based) Euparal has withdrawn moisture from the pollen. Clear nail polish showed a similar, but more pronounced effect as Euparal. The deformations of the pollen are very clearly visible. Evidently the solvent of the nail polish also removed significant amounts of water from the specimen. The nail polish itself lost some of its volume during drying and started to shrink as well. Air bubbles also became visible in the nail polish. Irregular drying of the mounting medium and a change in the shape of the mounting medium during drying can lead to shear-forces, which may distort the shape of the specimen. What about Glycerin Gelatin (glycerol gelatin, jelly)? Glycerin Gelatin is a water-based mounting medium. Glycerin Gelatin according to Kisser is one of several Glycerin Gelatin variations. It is a common medium for mounting pollen. Due to its water-based nature it does not cause the pollen to shrink. I’ll add a picture of this, when I have some of this mounting medium available. An alternative water-based mounting medium is fructose syrup. Both Glycerin Jelly and fructose syrup do not dry completely and therefore require a sealing of the sides of the cover slip with nail polish (but the pollen do not touch the nail polish). First, permanently mounting a specimen is not only important for slide storage. The mounting medium significantly influences the transparency, resolution and shape of the specimen. Second, the choice of the mounting medium depends on the type of specimen to be observed and on the type of microscopic technique to be used. For phase-contrast work the refractive index of the mounting medium should be different from the refractive index of the specimen. For bright-field work the refractive indexes should be similar. Large differences in refractive index can lead to the dark fringes as seen in the air-mounted specimens. So which mounting medium now results in pollen grains with a “true” or “correct” shape? The problem now is: what is the “correct” shape? Biological specimens may change their appearance depending on the environment. After a rain shower, the pollen may have a more roundish appearance, after having osmotically absorbed much liquid. Pollen that has dried in the air may resemble more the shape of the Euparal and nail polish samples. The choice of the mounting medium may therefore even include these considerations. Excellent presentation of the material. Best I have found on the internet. What would be the effect on a sample of paramecia in water if the mounting fluid is BALSAM CANADA (NEUTRAL IN XYLENE)? if you want to use Canada Balsam, then your sample has to be completely free of water. You have to take your sample containing the paramecia, put a drop on the slide and then air dry it until all of the water is gone. Only now you can add the Canada Balsam. The drying process can cause the cells of the sample to shrink and change shape. For this reason, Canada Balsam is not the recommended mounting medium for these delicate samples. 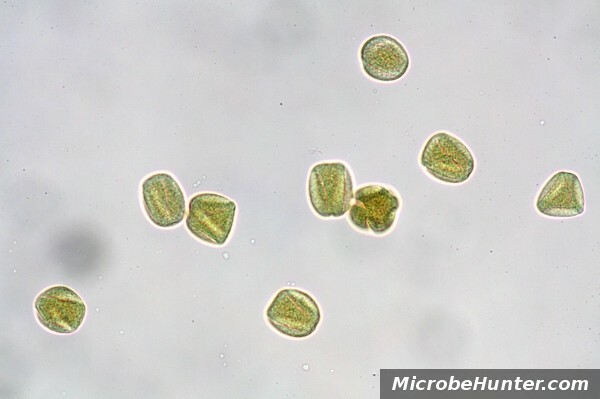 Many Paraecia might also have eaten algae, which are green. The solvent in the Canada Balsam can also result in the dissolving of the green chlorophyll, and loss of green color. I would try it out and see if it works, but generally solvent based mounting media are not used for mounting delicate water organisms. Canada Balsam is used for histologoical sections of tissue. These have been dehydrated and soaked in xylene before mounting. One disadvantage of Canada Balsam is that you have to use the solvent xylene, which is not healthy. Euparal is able to replace Canada Balsam in many respects, but here again you have the same shrinking and discoloration problems. 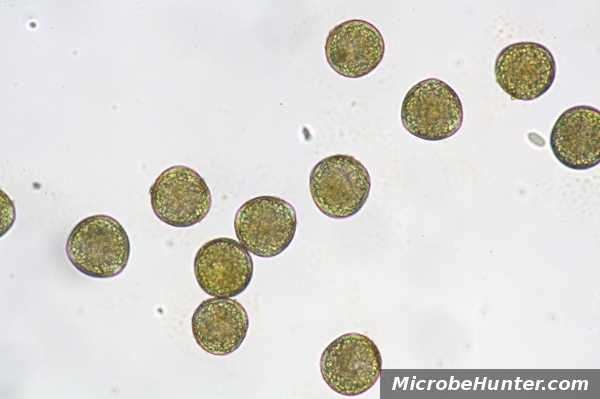 Water life, algae, ciliates (paramecia), pollen, spores and other specimens that shrink easily when dried are better mounted in Glycerine Gelatin. This is a water based mounting medium, which does not dry completely. You have to seal the corners of the cover glass to prevent complete dehydration of the glycerine gelatin. This is a great site for broadening my narrow experience of microscopy; you see I’m spoiled at work with phase contrast for in vitro cell work – but the samples are a bit dull! I bought a cheap(ish) microscope for my daughter to explore the world of the very tiny – I’m learning a lot from this site regarding stains, fixatives and mountants.